In February 2010, a tsunami ravaged the coastal town of Constitución, Chile, washing away lives and homes in the ensuing tidal waves. Mere days after the freak tsunami, Rev. Omar Kinas, who had been called by the confessional Lutheran Church of Chile to serve in another location, was asked to go to Constitución instead. Rather than shy away from tragedy, Rev. Kinas asserted that the people of Constitución needed the Gospel more than ever. He proceeded to plant two mission churches: Centro Comunitario Luterano “La Resurrección” (The Resurrection) in Constitución, and another in nearby Talca, collectively known as Misión Maule. 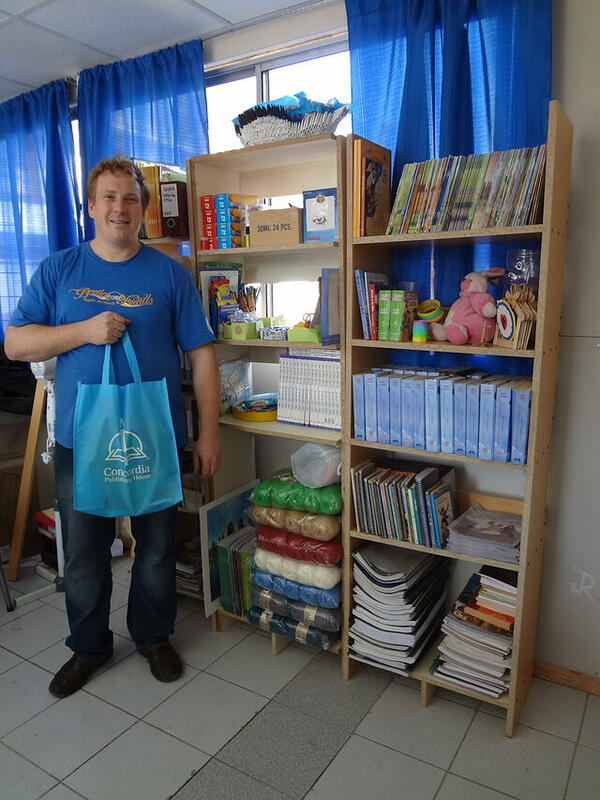 The tsunami-ravaged town of Constitución, Chile, received a new library of Spanish books, teaching materials, and coloring books from CGO! Today, La Resurrección is a beacon in a town still recovering from catastrophe. But help is needed—so much so that in partnership with the local arm of Lutheran Hour Ministries, Rev. Kinas had been requesting a volunteer group for several years to no avail. Just when he and his ministry team had reached the point of giving up, God provided. The hardworking group who answered the call was comprised of seven servants from California, Missouri, and New York. Tasked with both construction and English conversation practice, they worked together to hang a large lighted outdoor sign for the center, varnish two wooden walls and a bathroom, seal and plaster a crumbling concrete wall, and begin foundation work to double the mission’s physical space. 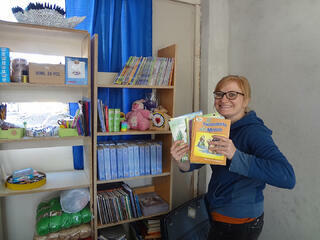 Additionally, they offered a series of hour-long sessions for locals to practice their English with native speakers. The fruits of their labors will bless many. In addition to ongoing programming for all ages, La Resurrección’s larger space means that the dream of an after-school program can become a reality. And, thanks to Concordia Gospel Outreach, Spanish Arch® Books, coloring books, Bibles, catechisms, and more have been donated to aid the mission and provide something far more enduring than bricks and mortar: God’s Gospel promises. In addition to delivering books from CGO, the American volunteers helped repair the church building from the devastating 2010 tsunami and taught English-speaking lessons. After a week of exhausting labor, the seven-person mission team was blessed to participate in a joy-filled worship service. By God’s grace, they witnessed a young man named Francisco be washed in waters of a very different kind—those of Holy Baptism—and rejoiced as he and two others confirmed their faith, becoming the first official members of La Resurrección. Floodwaters certainly left their mark on La Resurrección and its community. In fact, the aforementioned concrete wall still plainly bears the waterline from the events of 2010. Psalm 42:7 laments, “All Your breakers and Your waves have gone over me.” But four verses later, this refrain is heard: “Hope in God; for I shall again praise Him, my salvation and my God.” True to its name, La Resurrección stands ever more ready to be a faith-filled house of praise in a hurting community, constantly reaching out with Christ’s love—and Spanish-language resources that testify about that love. 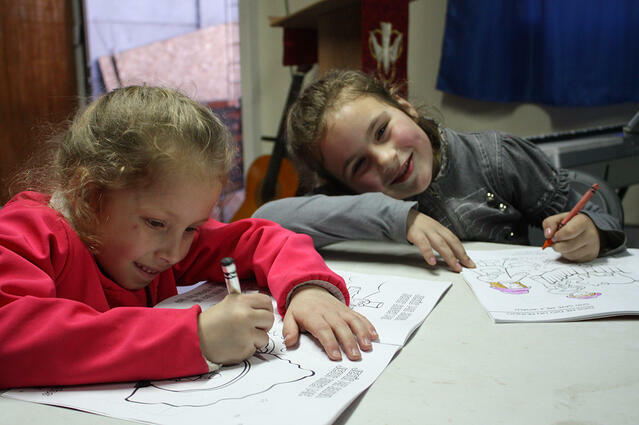 Because of your support, La Resurrección—one of only a handful of Lutheran churches in Chile—is equipped to become a hub of Christian education! We need your help to continue the mission. Concordia Gospel Outreach is able to send the Gospel all over the world because of the generous support of our donors. Every donation goes toward sharing the Gospel with someone who might never know Jesus. We encourage you to partner with us in this important work. << Two families in Mexico receive new homes—and lasting spiritual promises! 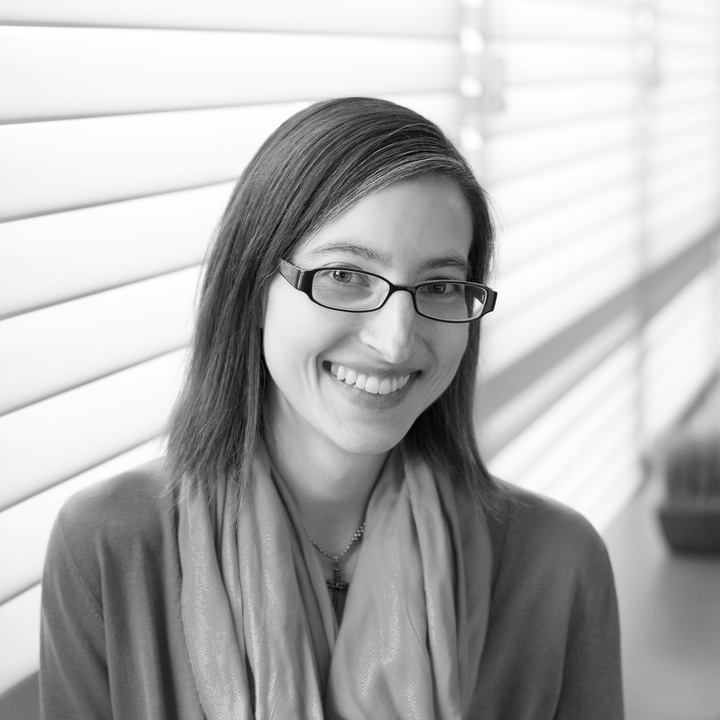 Erin Mackenzie has been part of Concordia Publishing House’s marketing and eCommerce team since 2012. After majoring in Spanish at Drury University, she served as a missionary on the U.S.-Mexico border. When she’s not exploring the world and hablando el español—too often according to her cat, Freddy—Erin enjoys reading, trying new recipes, and challenging anyone who claims they can beat her at Scrabble.